Contouring is all the rage and there are many products on the market that get the job done, however the easiest, most natural contouring product, in my opinion, is the Anastasia Contouring Kit. Take it from the founder of a cosmetic line, I have attempted to create a kit with a similar concept but have not been able to come up with anything that tops this fabulous contouring palette. Until I do, I will hold dear my Anastasia Contouring Kit. The Anastasia Contouring Kit comes in two color waves making it great for all skin tones.Each palette has 3 colors for highlighting and 3 colors for contouring. The best part is, you don’t have to discontinue the whole palette if you run out of your favorite color, just go to Anastasia’s website and reorder the shade that you need. I use the palette on the left. The banana color looks great highlighted on my forehead and under the contouring under my cheekbone. The matte pink color looks nice under and around the eye area after concealing. I mix two of the contouring colors for shading around my hairline, jaw line, and under my cheekbone. 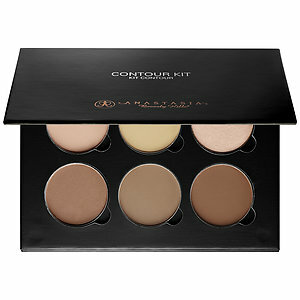 You can find the Anastasia Contouring Kit at Sephora and the refill pans can be purchased direcrtly through Anastasia.